There will be an entrants briefing at the car inspection tent in the pits at 5.00pm on the Sunday afternoon before Speed Week (Subject to change). ALL drivers must attend an entrants briefing, make sure you get your wristband punched. After the meeting there will be an opportunity to drive Track 1 and have all the features of the track shown to you. There will be additional entrants briefings on the Monday and Tuesday time and place to be advised. You cannot compete if you have not been to an entrants briefing and had your name checked off. I’d like to begin by acknowledging the Traditional Owners of the land on which we meet today, the Barngala, Kokatha and Wirangu people and pay my respects to Elders past and present. We acknowledge and respect the deep spiritual connection and the relationship that Aboriginal and Torres Strait Islander people have to Country. Welcome to drivers and riders, team managers and support crews to Speed Week. This briefing is to give you important information so please pay attention. The Race Director is Steve (Animal) Charlton. The Chief Car Inspector is Lionel West. The Chief Motorcycle Inspector is Graham Hadley. Technical Chairman is Bob Ellis. Our Chief Timer is Bruce Willmott. Our Doctors are; Dr. Scott Lewis from Wudinna and Dr James Telfer who has come down from Queensland. Any questions will be answered at the end of this presentation. RECORDS - There were 80 records set at Speed Week 2018 of these there was 41 existing records broken and 39 new records set. Over four and a half days there was 422 runs on Track 1 and 429 runs on Track 2 for a total of 856 runs. 200MPH ACHIEVERS - The DLRA also wishes to recognize each of those competitors who have achieved 200MPH for the first time. In recognition of their achievement they receive a special DLRA "red hat with black visor". 200MPH Club - We want to recognise all those that have reached a significant milestone in Land Speed Racing. To be eligible for the 200MPH Club the competitor must have exceeded 200MPH whilst setting a new record for their class. Each new 200MPH club member receives a specially embroidered version of the "red hat" to signify their achievement. 300MPH Club - We want to recognise all those that have reached a very significant milestone in Land Speed Racing. To be eligible for the 300MPH Club the competitor must have exceeded 300MPH whilst setting a new record for their class. Each new 300MPH club member receives a specially embroidered "red hat" to signify their achievement. By entering this event you have acknowledged that land speed racing is dangerous, and you are exposed to certain risks. You may be injured physically, mentally or worse. Your machinery or equipment may be damaged, lost or destroyed. Others may ride dangerously or with a lack of skill. The track or event conditions may be hazardous and change without warning. 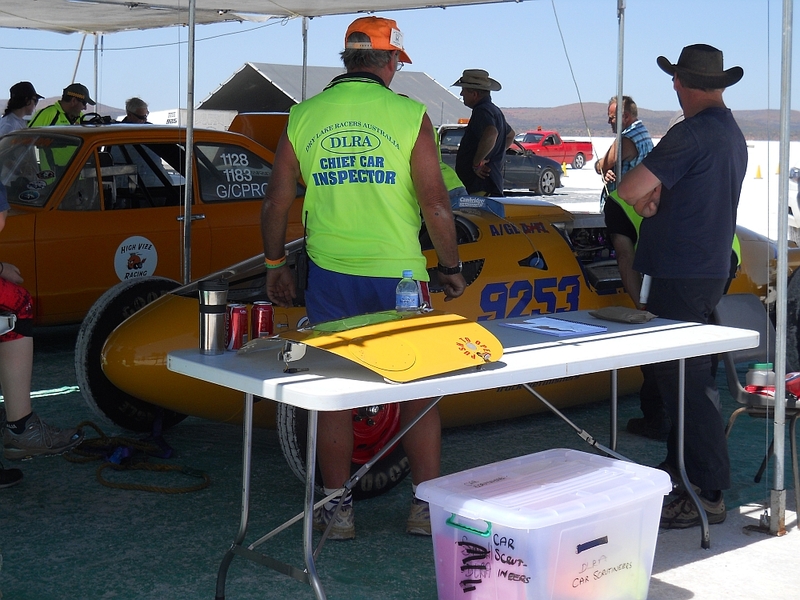 You have an obligation to yourself and to others to act safely and within the law, and the rules and regulations of the Dry Lakes Racers Australia Inc.
Make sure you have read and understood the duty of care statement on your entry form and any final instructions. If you believe you have been disadvantaged due to a rule being broken or have an issue with the behavior of another competitor or their crew then please see the Race Director. Should he not be able to address your concerns then you have the right to formally lodge a protest through the Event Registrar to the Chief Inspector of the event. Taking the opportunity for prior inspection of the track. Driving and riding to the track conditions with due regard for the safety of other riders and officials. Obeying directions of officials and medical people. If you have safety concerns with the venue or the operation of the meeting you need to see the Race Director. If I cannot satisfy your concerns, then you need to consider withdrawing from competition at this meeting. All fuel and oil containers must be labled with their contents and must be stored in a bund or secondary container capable of holding all the fluid stored in the original container. It must be stored in proper containers, in a safe place, away from naked flame. All competition vehicles must display a hazard lable describing the fuels used in them. This event is run solely by volunteers. There are a critical number of volunteers required each session in order for the event to proceed. If we do not have enough volunteers each session, the event WILL NOT PROCEED. When volunteering for timing positions, please arrive at the registration van early. If you are late, this will delay the event and reduce the number of runs we can have in a day. You have permission to jump the queue at the edge of the lake. 0730 for the morning session, returning at 1245, and 1300 for the afternoon session, returning at 1830. If you don’t like the way a volunteer is doing their job, or if you don’t like the way the event is run, consult the Race Director. Volunteer abuse will not be tolerated and may lead to you being stood down for the day or excluded from the event. Be mindful of the security of your equipment when you are in the pits. Be mindful of public safety when you are in the pits and on the access roads. The lake is a National Park and a public road, all South Australian road rules apply including seat belts to be worn in cars, helmets on riders and not riding in the back of utility vehicles. Speed limit on the ramp is 5 kph, on the access roads 60 kph and keep to the left. Random testing may take place at any time during this meeting. If possible, get yourself and your vehicle off the track as soon as practicable. On track 1 turnout to the RIGHT, on track 2 turn out to the LEFT as this will put you closer to fire and rescue vehicles. Damaged vehicles or vehicles in an incident must return technical inspection prior to competing again. In the event of an incident, under no circumstances are team or family members (and especially media) permitted to enter the track areas, as you may in fact hinder emergency vehicles in the performance of their duties. The majority of the timing equipment is located on the opposite side to the turn out i.e. :- left hand side of track 1, right hand side of track 2, so please do NOT leave the course other than on the turn out side. The timing beams are located behind the marker flags. If you need to abort the run, focus on where you want to go, not on what you want to avoid. If you focus on the marker flag because you want to avoid it, chances are, you will hit it. If you do hit any markers or timing equipment, please let the rescue crews know before leaving the track. We may not know the equipment is damaged until the entrant behind you has nil result recorded because the equipment is damaged or out of alignment. If in doubt, let us know BEFORE leaving the track, as once you leave the track, the next entrant is cleared to go. The medical crew are located next to the Merchandise Truck and are happy to be consulted for any illness or injury. You are encouraged to consult the doctor early rather than letting anything get worse, and also let them know if there they have any significant health issues which may impact on them during the race. The Doctor has arrangements with SA Ambulance, the State Medical Retrieval Service and the Royal Flying Doctor Service for response to major incidents. The Doctor has also had discussions with Wrightsair regarding their possible role in transporting people to Whyalla or Port Augusta for care if required. Team and family who have an injured competitor must go to the Registration Van where they will be kept informed of the situation. They will be accompanied by a race official to the Medical centre when appropriate. If you have been in hospital in the last 7 days you should check in with the medical team so they know your medical history should they have to deal with you during the event. Competitors vehicles and support vehicles are to queue at the southern end of the pits to the west (or track side) of the access road. When the Pre-Stage Marshall receives a request from the start line they will signal for the first 10 vehicles to drive to the start line in order. There will be an exemption for a small number of vehicles that take a long time to stage or prepare. They will proceed directly to the start line and line up in the middle of the start line as it is difficult for them to turn sharply. Before leaving Pre-stage, the first entrant in each group of 10 will be given the order sheet for that group. They must give this order sheet to the Starters Assistant or take the order sheet to the start line van so the queue order can be entered into the timing system. At no time is a competitor or team member to talk to or distract the Starter from his duties. There will be an Starters Assistant available if that is required. There will be a designated area for each start line, the only people permitted in that area are the starter and the next competitor. There are various cables around the start line van and the start lines. The majority of these are away from the spectator area, however please be mindful of them, and do not walk or drive over them. This also applies at the registration area. Track 2 is a short course with timing over one mile only. Track 1 is a combination long and short course track with timing from the 2 to the 3, and from the 2 to the 5. Only vehicles that are faster than 175 mph are permitted to run long course on Track 1. As of 2019 record attempts are considered to be the average of two consecutive runs over the same mile. There are only 2 situations where an entrant will go to impound. Get your timing slip from Race Control and park your vehicle in the Impound lanes. Present to the Impound Officer within 15 minutes of making your run.. The Impound Officer will check the timing slip against the existing record. Where vehicles are entered in a GAS class, a sample of fuel will be taken. You will then have 4 hours to service your vehicle in Impound. Do not return the vehicle to your pit. The following morning, vehicles will be escorted to the start line. Once you have made your run, get your timing slip from Race Control. If the average of the two runs over the same mile exceed the existing record, go straight to Impound. Present to the Impound Officer with your timing slip and Record Certification Sheet.. The Impound Officer will check your attempts. Where vehicles are entered in a GAS class, a sample of fuel will be taken and both samples analyzed. The Technical Inspector will measure engine displacement and certify engine capacity. The Technical Inspector will confirm the vehicle class as correct. If all criteria above are successfully met, the Record Certification Sheet will be completed. The entrant, still has to present at Impound with his timing slip within 15 minutes. The entrant will still have up to 4 hours to work on his vehicle and must not return to their pit. The entrant goes to Pre-Stage and then makes a record attempt. 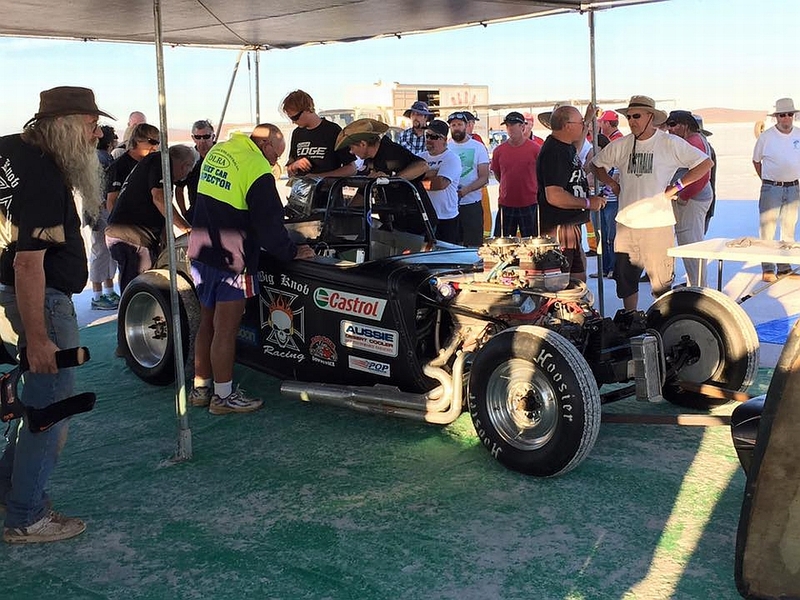 Nobody else can ride or drive the vehicle until the entrant has made his record attempt. • If the record has been broken, the entrant must proceed straight to impound for record inspection and the vehicle will not be released until after a determination has been made. • If the record has not been broken, the vehicle will be released and the next team member is free to make a qualifying attempt. If you become disorientated or lost while on the tracks, STOP. Whatever you do, DO NOT KEEP DRIVING. It makes you harder to find you and further for someone to chase you. On Track 1 when turning off the track, you do not stop until after you have cleared the "Course Clear" Bali flag. On Track 1, support vehicles must use the designated support vehicle track when traveling from the start line to the "track clear" flags at the exit point. Speed limit past the pits is strictly 60 km/h. Check Track layout map. Support vehicle UHF radios must be tuned to Channel 10 whilst on duty. Support vehicles watch your speed in front of the pit, 60kph only. On Track 1, all vehicles are running the short course, unless by prior approval with the Race Director, which means they turn out after the 3 mile and before the 4 mile. Only long course qualified vehicles can nominate to the starter that they want to go to the 4 or 5 mile. Track 2 is speed limited to 150 mph for cars and 175 mph for bikes. To go any faster you must run on Track 1. Speed limit in the pits is walking pace only. When you present your car for inspection you must have all your paperwork from registration. The driver and all his safety equipment, and the fully suited and strapped in driver will be required to perform a bail out from the vehicle. Unless a bailout has been previously logged by you in this vehicle, you will be required to be suited up and perform bailout. Bring your fully equipped support vehicle for inspection at the same time. No glycol or coloured coolant. It stains the lake. When you present your bike for inspection you must have all your paperwork from registration. The rider must have all his safety equipment with him at the time of inspection. Helmet, suit, gloves, boots, under garments, etc. Bikes will be started, and lanyards tested. No glycol or coloured coolant it's flammable in some circumstances and it doesn't evaporate and it stains the lake. The rules allow for water wetter which is coloured but disappears quicker than you can say where the hell did that go. The starter will be looking for the number on your inspected sticker to identify your vehicle. It is the entrants responsibility to ensure appropriate placement of the sticker so that the starter can read it. Only one entry sticker must be visible on the vehicle when it presents to the start line. When you are third in the queue at the start line, you should be ready to go. The starters assistants are there to check that your seat belt is tight enough, your helmet is done up, your visor down. Don't forget to pack your DLRA license and your log book! Pick up your paperwork from registration before you go to tech inspection. All entrants will receive a brief orientation when they present to registration, rookies a longer orientation. You need to return your completed paperwork to registration to receive your inspected sticker. No sticker and the starter will turn you away. If you are changing classes with the same vehicle, you need to pick up your paperwork, get your vehicle inspected, and submit completed paperwork to registration to receive your new inspected sticker. If you need to pay for anything, bring cash as we do not have eft-pos facilities. Do not leave your gear out in plain view, keep them locked up. Arrange with you pit neighbor to keep an eye on your gear whilst you're not there. On Track 1, if you break down or require assistance from fire and rescue, turn right off the track. On Track 2, if you break down turn left towards the return road, if you require assistance from fire and rescue, turn right off the track. If there is an incident on the track, under no circumstances are spectators, media, or crew to enter the track or surrounds, this is a prohibited area at all times and restricted to competition and official vehicles only. It is imperative that this area is kept as clear as possible especially during an incident. Do not drive on the actual track, you will drive along the east side next to it. The timing start point will be shown to you, note the signage. The other timing points will be shown to you, note the signage. The exit points will be shown to you, note where they are located and how they are sign posted, also note the all clear flags and position. 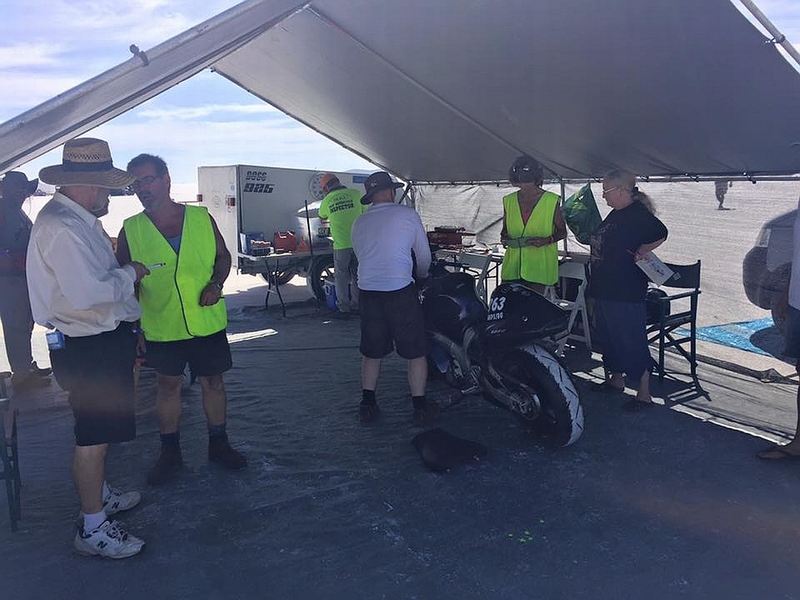 All first-time competitors (Rookies) must assemble at the Car Inspection Tent after the entrants briefing for additional information, make sure you sign the attendance sheet. Rookies are restricted to Track 2. You are restricted to under 125 mph or as directed. Once you have been observed made you're first pass successfully, you’re not a Rookie any more. The DLRA run a graduated licensing system. Once you have made your rookie pass you can then attempt your Category D - 125 mph license. Over the last couple of years, we have had instances where things have gone missing. Just be careful where you leave things. This is just another reason why we don't want spectator vehicles in the pits.